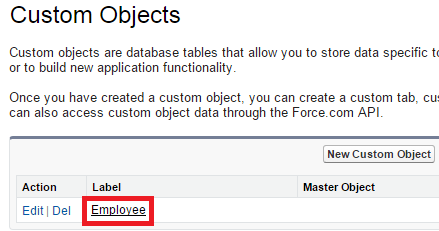 Infallible Techie: How to delete all the records from an Object in Salesforce? How to delete all the records from an Object in Salesforce? Truncating a custom object permanently removes all of its records. You can’t recover the records from the Recycle Bin. A copy of the truncated object appears in the Deleted Objects list for 15 days—during this period the object and its records continue to count toward your organization’s limits—and then the copied object and its records are permanently deleted. 1. 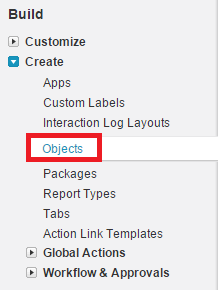 Go to Create --> Objects. 2. Select the object to Truncate. 4. 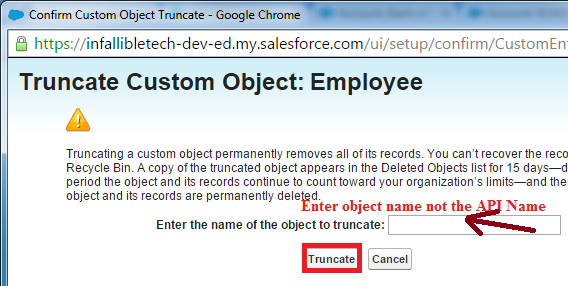 Enter the object name not the API name and click "Truncate".